Click to learn more about exclusive offers at McLaren Ascot, McLaren Bristol, McLaren Birmingham, McLaren Glasgow, McLaren Hatfield, McLaren Leeds, McLaren London or McLaren Manchester. If the heavens open while you’re in a convertible, the theory is you stay dry so long as you’re driving fast enough. It’s something to do with the ‘boundary layer’ of air that sits above the car at speed, but the more heavily raked the windscreen is, the faster you have to drive. That’s probably why I’m getting drenched in this rather sleek McLaren 570S Spider, but there’s no way that roof is going up. 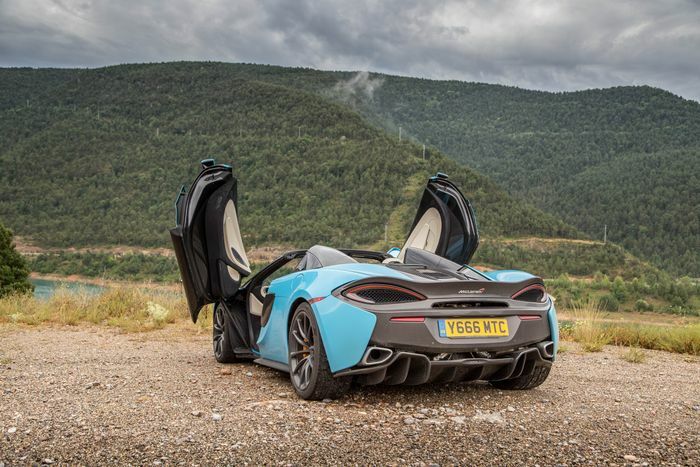 I came here to experience alfresco McLaren motoring, and damn it, I won’t let Mother Nature disrupt that. Given that this is a 562bhp, rear-wheel drive car that dumps out a fairly fat wad of torque at around 3000rpm, I’m not being quite as careful with the throttle as I ought. 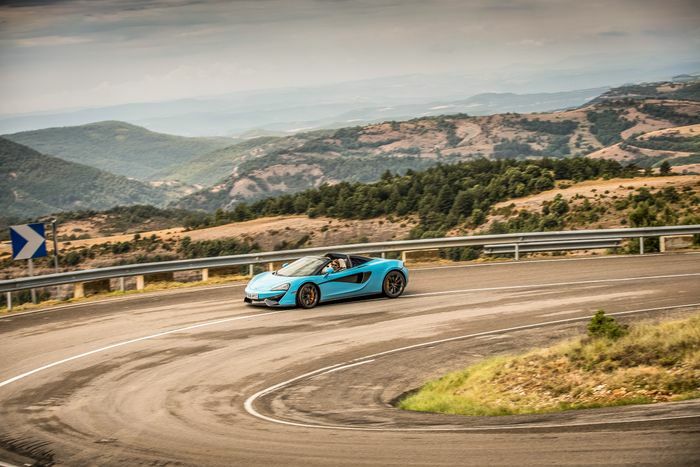 But wet grip and traction here is good: the rear Pirelli P Zero Corsas are rarely reaching the end of their tether, and when they do let go, the electronic aids are surprisingly subtle and effective when they intervene. The road I’m on - about an hour north of Barcelona - is all about undulations, satisfying camber changes and a crap load of tunnels. The perfect place for a car like this, then, but the way it ruthlessly dispatches each corner with a scream of flat-plane V8 noise is no surprise whatsoever. 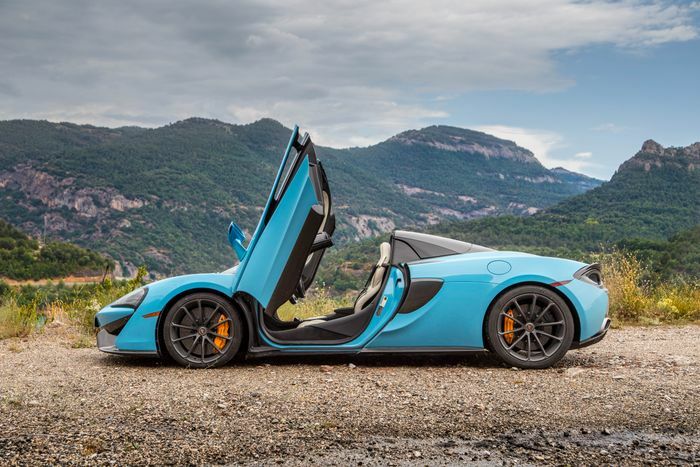 It feels exactly like the coupe, because it’s scarcely different - the wonders of McLaren’s Monocell II carbonfibre tub mean that hacking the roof off hasn’t affected rigidity at all, and there’s no need for heavy under-body strengthening. In fact, the design never needed a roof. 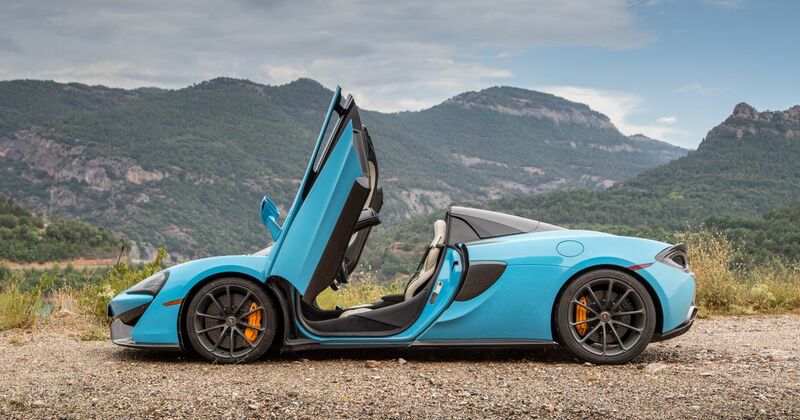 The 570S Spider has gained 46kg compared to the coupe, though, and that’s for the new roof mechanism and the roof mechanism alone. There is also a new, bigger rear spoiler to compensate for the loss in downforce caused by the roof removal, but that’s about the only other change. It’ll still do 0-62mph in 3.2 seconds, and it’ll hit 0-124mph in 9.6 seconds, a tenth down on the coupe. Which we very much doubt you’ll notice. Oh, and with the roof down you’ll ‘only’ be able to do 196mph. The rain’s easing off and the tarmac drying out, so I’m starting to push the Spider a little more. As I do, it reveals itself to have the same feedback-laden, wonderfully linear hydraulic power steering, the same deliciously pointy front-end and the same impeccable balance and body control as the coupe. In terms of handling there’s nothing new to learn, so everything I’m doing today is entirely pointless, surely? Well, no, actually. Aside from the fact I’d be completely mad to say no to a day of driving a supercar around some jolly nice roads, the infinite headroom modifications aimed at the 570S completely change the experience of driving it. The sensation of speed, the mechanical violence of that V8, the sense of occasion - it’s all heightened by the change in body style. You also get a much better idea of how much attention you’re drawing, which is a lot. Wherever you go. From school kids to police officers, everyone seems to love this car. With the road opening out a little, I have the opportunity to further play around with the capabilities of that V8. It’s far from your typical twin-turbo engine: yes, there’s that fairly hefty torque delivery from about 3000rpm, as I mentioned earlier, but it loves to rev (peak power is at 7400rpm), and if you keep it spinning above about 5000rpm, you’ll find it oddly linear and N/A-like as you smash into the 8500rpm red line at every available opportunity. Ignore those International Engine of the Year gongs thrown at Ferrari’s 3.9-litre V8 - that turbo lump ain’t got nothing on this one. The weather reprieve has been all too brief, and it’s throwing it down again. The rain’s collecting at the end of the drainage channel on the corner of the windscreen, meaning every 20 seconds or so surprising quantities of water are dribbled all over my left leg. Which isn’t awfully pleasant, but I’m not sure we should be too miffed about this apparent design quirk: only an idiot (like me) wouldn’t pull over or slow down to the required 25mph limit to put the roof up, which - by the way - takes just 15 seconds. The more relaxed bimble back to the airport provides a chance to reflect on the only real bad point of the 570S: the infotainment system is a bit rubbish. For much of the day I haven’t been able to see the portrait screen at all due to the sunlight bouncing off it (a combination of the angle it’s at and the surface, I’m thinking). When I have been able to see it, I’ve found the system too fiddly. The location arrow on the satellite navigation also has a habit of frequently going off piste or just not clearly showing the position you’re in, a problem I haven’t had since using an aftermarket TomTom system circa 2007. Buy a 570S, and I suspect Google Maps will become your new best friend. It’s an annoyance, but it pales in comparison to the list of gripes I have with one the car’s closest rivals, the Audi R8 Spyder (a Plus version that’s closer to the 570S in price and performance is on the way). With an extra 170kg on board the Audi is quite the fatty. It’s too keen to understeer. The driver’s seat doesn’t recline enough nor go back far enough. And it looks surprisingly naff with the fabric roof up. Suddenly, a moderately shonky infotainment system doesn’t seem like a big deal, not when dynamically the 570S hovers somewhere close to perfection. 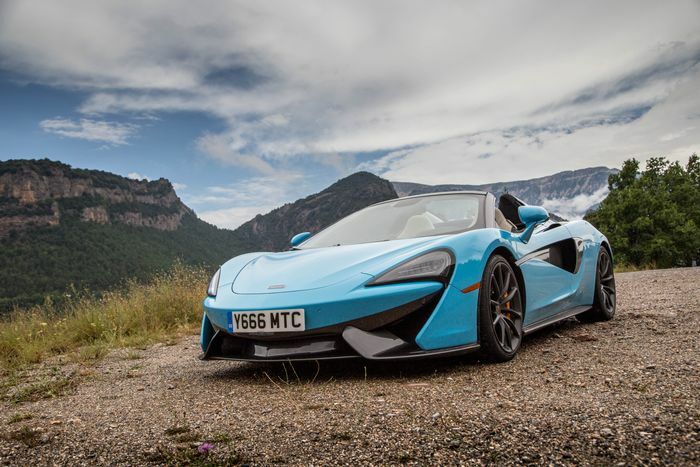 "The 570S Spider manages to be a proper driver's tool and a weapon of tomfoolery all at the same time"
The R8 makes up for its foibles with a 5.2-litre, naturally-aspirated V10 that offers up a kind of internally combusted drama the 570S simply can’t match. It’s a less serious, more theatrical car, but there’s something to be said for how its new arch-nemesis manages to be a proper driver’s tool and a weapon of tomfoolery all at the same time. Given the money, is it the one I’d buy? I’ll, err, get back to you on that. 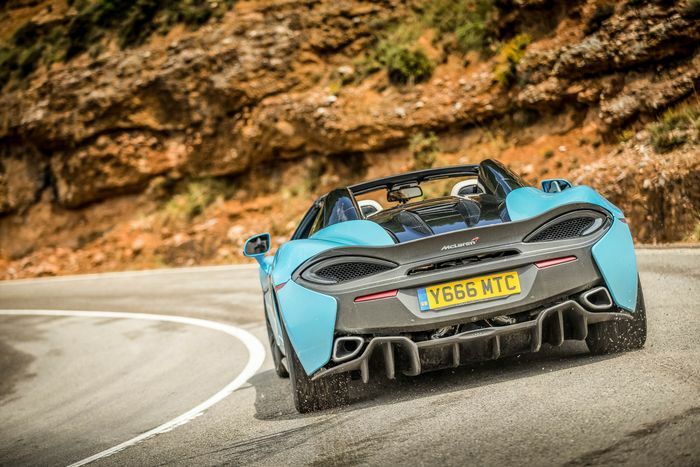 It’s a tough call even if the McLaren is clearly the better car technically, but one thing’s for sure: if you want to buy a Sports Series motor from Woking, you need to make it this one.